On the 24th (Sun), look for gifts at Into The Blue Gallery and then zoom along the surf with a waterskiing or jet-skiing adventure. Get ready for a full day of sightseeing on the 25th (Mon): discover the deep blue sea with a scuba or snorkeling tour. For where to stay, other places to visit, photos, and tourist information, use the Airlie Beach road trip planning site . Melbourne to Airlie Beach is an approximately 6-hour combination of flight and bus. You can also do a combination of flight and ferry; or drive. Plan for a bit warmer nights when traveling from Melbourne in February since evenings lows in Airlie Beach dip to 28°C. 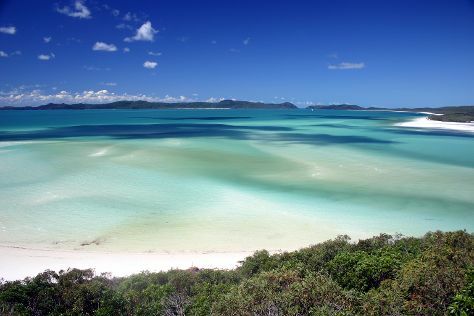 Wrap up your sightseeing on the 25th (Mon) to allow time to take a bus to Whitsunday Island. Start off your visit on the 26th (Tue): contemplate the waterfront views at Hill Inlet and then kick back and relax at Whitehaven Beach. To find maps, more things to do, other places to visit, and tourist information, read our Whitsunday Island tour site . You can take a bus from Airlie Beach to Whitsunday Island in an hour. Another option is to ride a ferry. In February, plan for daily highs up to 36°C, and evening lows to 26°C. Wrap up your sightseeing on the 26th (Tue) to allow time to travel to Cairns. Start off your visit on the 27th (Wed): identify plant and animal life at Wildlife Areas. For other places to visit, more things to do, reviews, and more tourist information, use the Cairns holiday planner . Traveling by flight from Whitsunday Island to Cairns takes 3 hours. Alternatively, you can take a train; or take a bus. February in Cairns sees daily highs of 36°C and lows of 28°C at night. Cap off your sightseeing on the 27th (Wed) early enough to go by car to Port Douglas. Kick off your visit on the 28th (Thu): discover the deep blue sea with a scuba or snorkeling tour. Get ready for a full day of sightseeing on the next day: take a memorable tour with Tours. To find traveler tips, ratings, reviews, and more tourist information, refer to the Port Douglas driving holiday planner . You can drive from Cairns to Port Douglas in 1.5 hours. Alternatively, you can take a bus; or take a shuttle. In February, plan for daily highs up to 36°C, and evening lows to 28°C. Finish up your sightseeing early on the 1st (Fri) so you can travel back home.